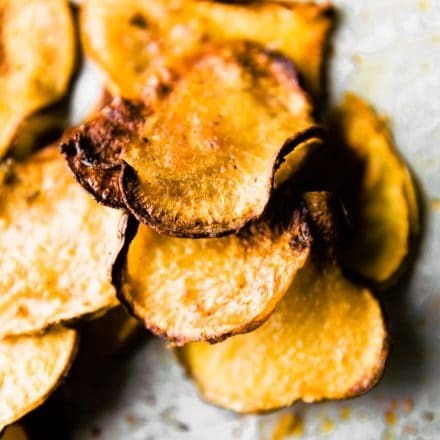 Easy BBQ Baked Rutabaga Chips. Healthy, paleo/vegan friendly. Preheat oven to 450F. Wash and Cut rutabagas into fine slices. A mandoline slices works best to cut into about 1/4 to 1/2 in thick or slices. The thinner the slices, the faster they will bake. In a small bowl or ziplock bag, place all your spices and oils. Carefully coat your rutabaga chips in the bowl with oil and spices or in the bag. Lay them flat on a cookie sheet and spread evenly. Place in oven. If your chips are very thin, be sure to check on them often so they don’t burn. Bake for 25 minutes, turning them half way. After 25 minutes, reduce to 350F and cook for an additional 5-10 minutes until crispy. Cover if they start to burn on edges. Bake longer or shorter for texture to be more or less crispy. Remove for oven and let cool. Transfer to bowl or plate. Season with extra red pepper flakes or smoked sea salt if desired.